The expanded energy tax credit gives homeowners a break on green improvements done by the end of 2010. Here are 8 ways to spend your green. Get an app for your iPad and control your energy use from afar.  QUIZ: What uses less energy? Control your energy use with an app that connects your home's electric grid to a smart phone or iPad. You can turn off lights, air or appliances when they're not in use, even program them to turn on and off at certain times. No more leaving the air on all day just so your house is cool when you walk through the door. You can simply turn it on, or program it to turn on, 10 minutes before you're due home. You can even learn what changes other family members make, according to Jim Gist, a vice president at Control4. "If your teenage kids are home alone and they turn down the air to 62 degrees, your iPad or iPhone will alert you and you can change it," he said. 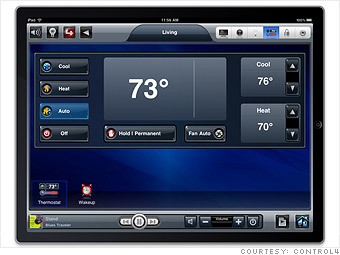 If you already have the home control module and an iPad, you can download the app from iTunes for free, although you have to pay a one-time licensing fee of $99. You should be able to make that back in energy savings. Gist said reports are it can cut lighting use 10% to 30% and air conditioning costs between 20% and 40%.